Roman glass dangling earrings, made in Israel. Designer jewelry. 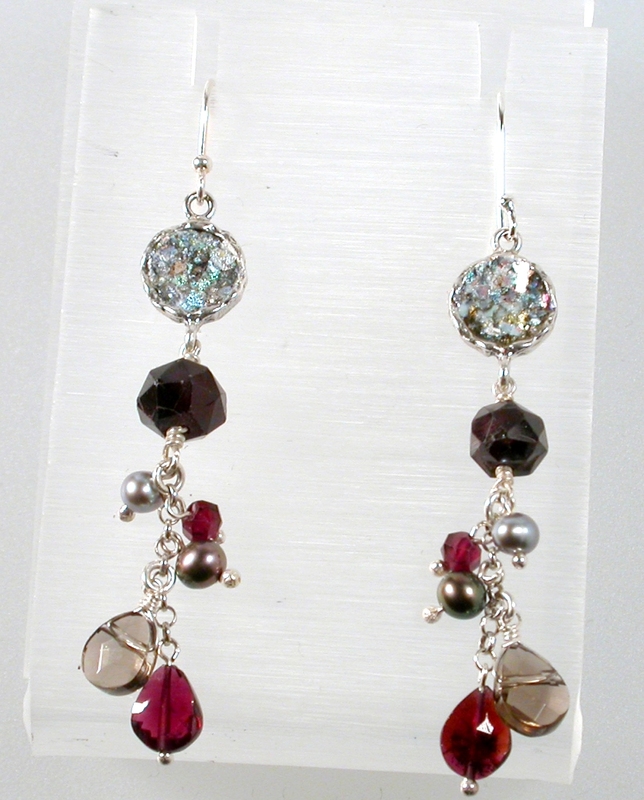 Dangling earrings - sterling silver 925 - set with roman glass from Israel and semi precious stones. Roman Glass is an ancient glass, discovered in archaeological excavation sites in Israel. Israel is one of the few locations in the world in which a series of geological and climatic phenomena coincide enabling the formation and preservation of the strikingly colorful glass. Made from the hand-blown fragments of ancient perfume pots, lamps, flasks, vases, cups, and bowls dating back to 100 BC found by archaeologists sifting through the fallen pillars and once magnificent cities of the Roman Empire. Almost two thousand years of conflict with mineral rich soil and oxidation combine to form this precious glass. A special characteristic of ancient glass is its luster which only the passing of time can bestow upon it, further enhancing it's original beauty. The fine Sterling Silver Roman Glass Jewelry is one of the most popular types and styles originated from Israel. The designs for the jewels are based on artifacts and drawings also discovered on the archeological digs. In our site you will find modern design earrings side by side traditional Judaica motifs.